We produce for Italy and abroad lineaguscio gelato decorating molds. 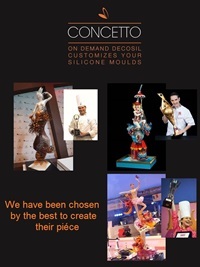 Italian leaders of silicone moulds, we create and sell for over 10 years lineaguscio gelato decorating molds, food safe silicone moulds worldwide to confectioners, bakeries and Delicatessens. Silicone food molds for ice cream, ideal for applying new techniques in decorative ice cream, confectionery, frozen confectionery, ice cream cakes, frozen desserts. The line includes LINEAGUSCIO molds for stick-ice cream, to create different geometric shapes. The decoration implements the aesthetic appearance of their handmade creations. The right approach to increase and satisfy their customers.